Remember when I said I dream of mangos, chipotle peppers and bacon? Well this has two of the three, and to make up for the absence of crispy bacon, it can be served with crunchy chips! So in my eyes, it doesn’t get much better than this. 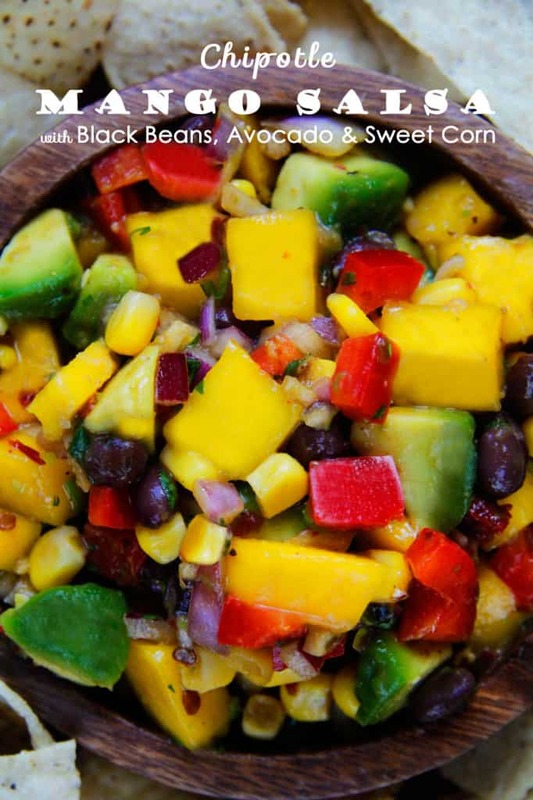 Sweet mangos, creamy avocados, crunchy red bell peppers, sweet corn and black beans brightened by lime juice and cilantro then spiced to your desired heat with chipotle peppers. Its fresh, vibrant, delish and simple to make! Just chop, toss, eat! 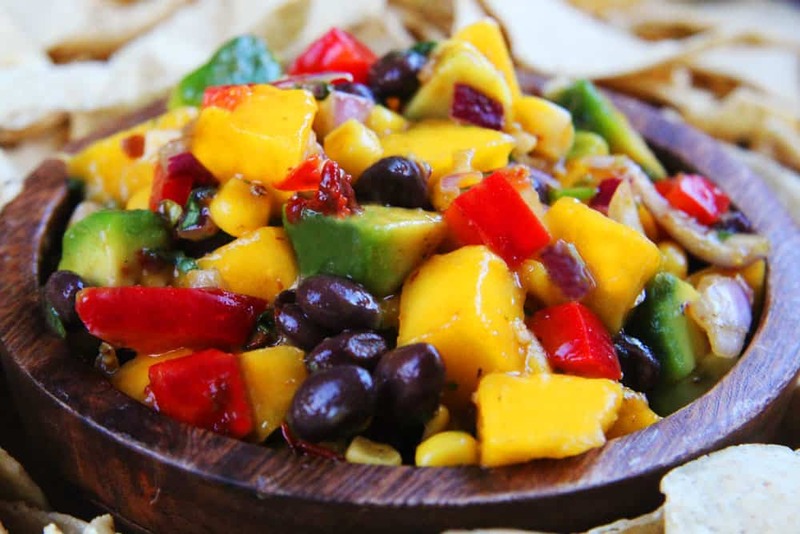 This Chipotle Mango Salsa is perfect for spring and summer gatherings and perfect for you because you can tailor this salsa to your personal tastes by adding more or less of any of the components. Sometimes I half the recipe and add more mango, because we know how much I LOVE mangoes! Add all the ingredients (starting with just 1 tablespoon chipotle peppers) to a medium mixing bowl and toss well. Taste and add additional chipotle peppers, salt, pepper, lime etc. to taste if desired. You can adjust the salsa to your own personal preferences by adding more or less (or leaving out completely) any of the components. 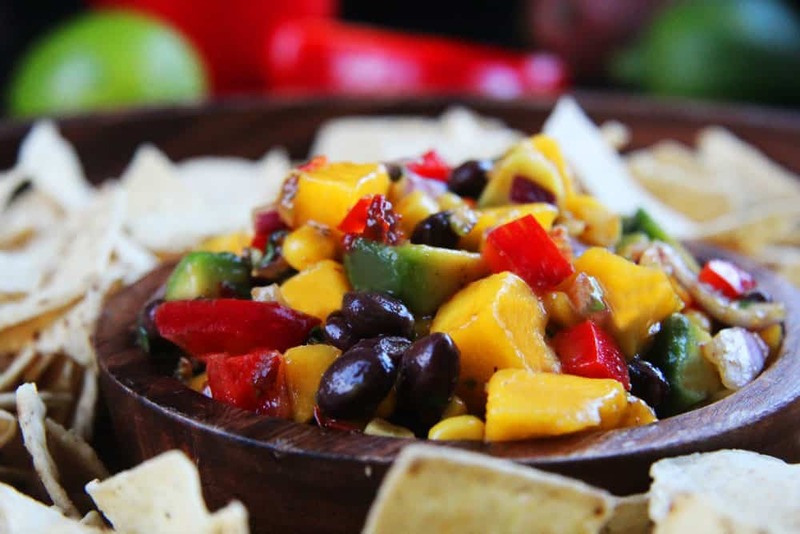 I love mango salsas… I am def going to try this one out! Thank you for sharing! Absolutely gorgeous and sooooo colorful! I LOVE colorful food! Wow that is fantastic!!! I should make this for sure. LOVE!! Thanks so much Rebecca! Its good on everything :)! Looks nice and fresh.. if i wasn’t allergic to avocado, this would be a great meal! Yes, please do! I think you’ll love it! you know what they say about a colorful diet its very healthy for you thanks for sharing looks awesome. So true! 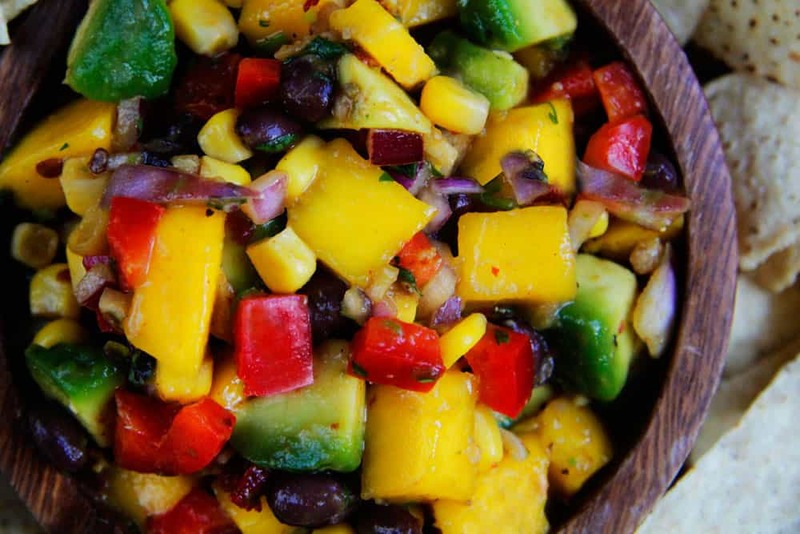 This definitely qualifies as colorful and healthy! Thanks Lorraine! 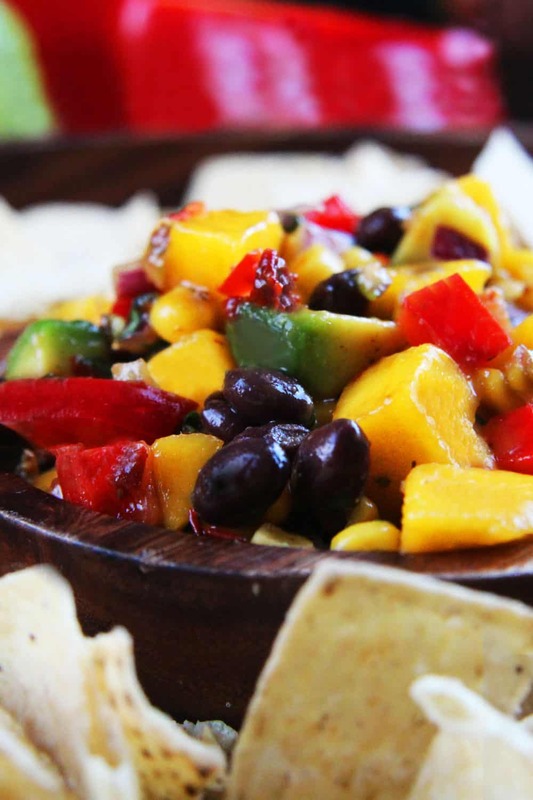 I love a mango salsa! I’m actually making some this Friday for my son who is visiting. He has requested fish tacos with mango salsa! Looks delish! That’s perfect! So happy you found the recipe just in time! Love the colors! This looks delicious! This looks like a great recipe and I’ve been looking for one. Looking forward to trying it. Glad you found it here! Enjoy Neva! 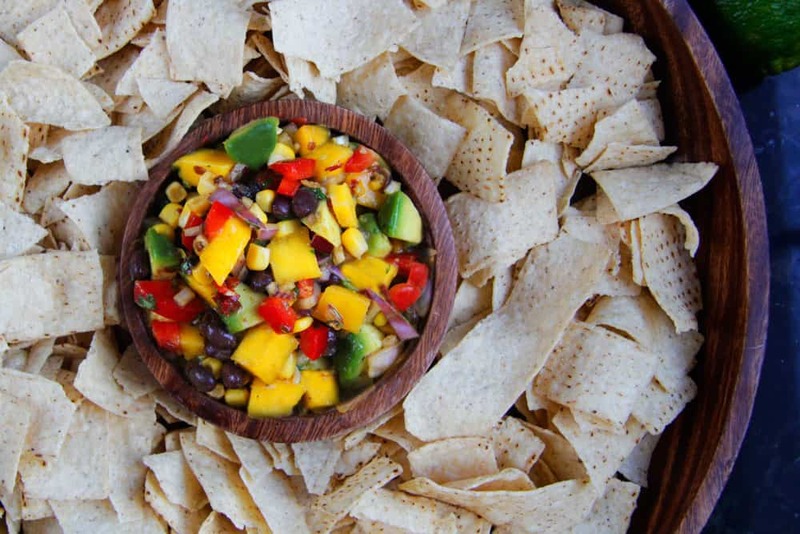 This salsa looks amazing, so fresh and colorful! Pinning it for you too! Thanks so much Mary Ellen, I appreciate it! OH! This looks so good, I want to have some right now! Thanks Jodie! I wish I could give you some! Thank you! Its always fun when food is pretty to look at AND eat :)! This looks so colorful and fresh! Can’t wait to try it out! Thanks Karen! You can try it just in time for spring/summer! I have got to come to your house for dinner sometime 🙂 you make the best stuff!!! The feeling is mutual! If only we lived closer :)! Wow what a bright and tasty looking salsa!!! omg looks delish. Also, what kind of Camera lens did you use to take those pics they are just GORGEOUS pics! That is so nice Tara! I use a Canon Rebel T3i, 17-75 lens. I usually have it set to a 70 zoom and am about 2 -3 feet away from the food. Thanks again! Now I’m hungry again! LOL. Those look fabulous! This was AMAZING. Made it for a teachers appreciation luncheon and it was a hit. Told them all about your blog and how everything I make from you is awesome. Oh Lynette, you are the sweetest, thank you! I love hearing you are enjoying my recipes – we must have the same palate 🙂 and thank you for sharing it with others!